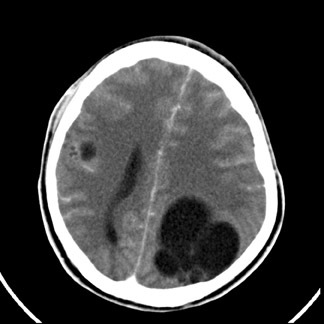 Contrast enhanced CT (Figures 1 to 4) showed multiple well-defined bilateral, rounded, cystic lesions in the supratentorial neuroparenchyma. One of the lesions showed daughter cysts (Figure 2). There was no perilesional edema. On injection of contrast, the lesions did not show significant enhancement. In addition to these lesions, there was cerebral edema. 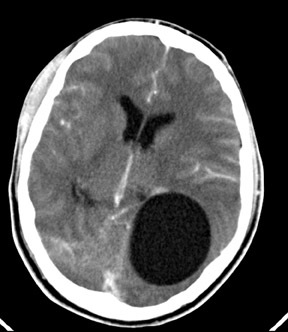 With these findings, a diagnosis of multiple cerebral hydatid cysts was suggested. Abdominal sonography did not reveal any cysts in other organs. The patient did not improve with conservative management and surgery was performed. The accessible cystic masses were removed and were confirmed to be hydatid cysts upon histologic examination. The patient improved with added drug treatment. Human echinococcosis, also known as hydatid disease is caused by Echinococcus granulosus. The larval stage is known as the hydatidcyst (HC). The disorder is caused by ingestion of dog feces that contain tapeworm ova. Intermediate hosts infected by larval hydatid cysts are usually sheep and cattle. Ingested ova hatch in the GI tract and liberated embryos can spread to organs via the portal or systemic circulation and develop into cystic larvae. 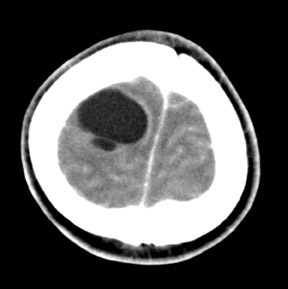 Though rare, hydatid cyst is an important differential diagnosis of cystic, intracranial-space–occupying lesions and is potentially curable. Diren HB, Ozcanli H, Boluk M, Kilic C. Unilocular orbital, cerebral and intraventricular cyst: CT diagnosis. Neuroradiology. 1993;35:149–150. Chang KH, Cho SY, Hesselink JR et al. Parasitic diseases of the central nervous system. Neuroimaging Clin North Am. 1991;1:159–178. Beggs I. The radiology of hydatid disease.AJR Am J Roentgenol. 1985;145: 639–648. Sierra J, Oviedo J, Berthier M, Leiguarda R. Growth rate of secondary hydatid cysts of the brain. Case report. J Neurosurg. 1985; 62;781–782. 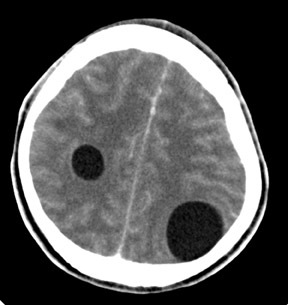 Multiple cerebral hydatid cysts. Appl Radiol.